As an actress, Gwendoline Christie is used to keeping secrets — she is, after all, Brienne of Tarth on Game of Thrones, meaning she knows a lot more than you do about whether Jon Snow is alive or dead. Her striking six-foot-three frame and sympathetic onscreen presence have gotten Christie cast in a range of major sci-fi and fantasy franchises like The Hunger Games and Star Wars, but when talking with the press for those highly anticipated projects, she’s usually not allowed to say much about her characters for fear of inadvertently spoiling something. When I sat down with Christie yesterday to discuss Star Wars: The Force Awakens, then, she surely wasn’t expecting to make any news. 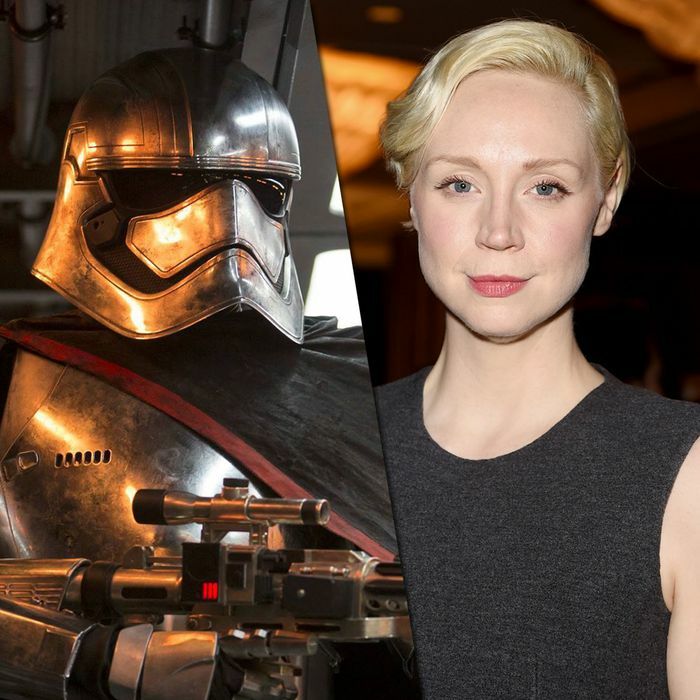 The film, which features her as chrome-polished Stormtrooper baddie Captain Phasma, hasn’t screened for press yet, and what little is known about her character has been carefully parceled out by director J.J. Abrams and co-writer Lawrence Kasdan. But what neither of us were counting on is that just before I met up with her, I’d managed to extract a scoop from Kasdan that was so secret, even Christie herself didn’t know about it: Captain Phasma, who’s set to make Star Wars history as the big-screen franchise’s first female villain, was originally conceived as a man. I happily obliged her: Kasdan had just recounted the whirlwind process of writing The Force Awakens, where he came onboard after a script from original writer Michael Arndt had been thrown out. Hundreds of people had already begun working on the film, and time was of the essence: All these top-tier technicians would be marooned without a compelling document to guide them. “It feels fresh,” I ventured.